An exciting exhibition called Die Kunst Von Aardman – or The Art of Aardman for our non German-speaking fans – has arrived in Frankfurt! Taking place at the Deutschen Filmmuseum until 30th October, the exhibition brings together some awesome original models, sets and artwork. 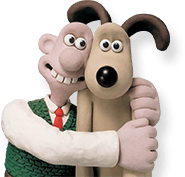 Favourite characters from the Aardman world are represented, including Wallace and Gromit. Shaun the Sheep, Morph and Rocky from Chicken Run. It’s the first major exhibition in Germany about the work of Aardman, charting its history over the past 4 decades, from the early days to the digital age. Visitors will be able to feast their eyes on gems from the Aardman sketchbooks, including first idea drawings and finished concept art, as well as seeing film sets from The Curse of the Were-Rabbit and Shaun the Sheep The Movie close up. Designed to be enjoyed by all ages, from young fans to long-time animation buffs, this brilliant exhibition gives a great opportunity to delve into the Aardman archives and get an insight into the processes involved in making award-winning animations. For more information, visit the Deutschen Filmmuseum website.